Need CE knee armors ? Fashion meets functionality, in these unique jeans with added Kevlar® protection pads in the knee and waist areas, to protect against "road rash". The jeans also include special outside zipperd pockets for adding CE approved hard armor in the knee area. On the outside these jeans just look great – but on the inside they are ingeniously designed to protect riders in the event of falls and skidding. 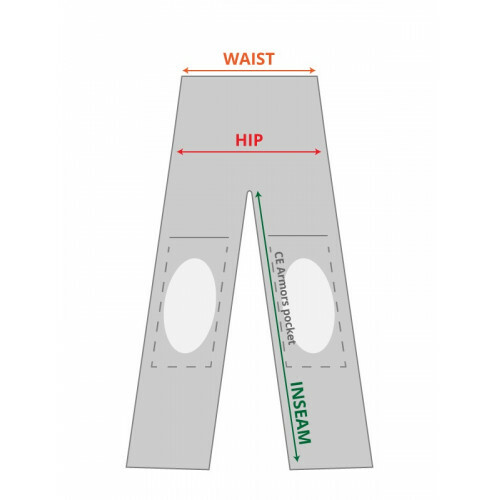 Its recommended to choose one size bigger then your current relaxed pants size thus because the Kevlar panels takes little more space . If you got some questions you are always welcome to contact us .